Miguel Almiron’s agent claims NUFC beat 4 Premier League teams to his signature.. – NUFC blog – Newcastle United blog – NUFC Fixtures, News and Forum. Miguel Almiron’s agent claims NUFC beat 4 Premier League teams to his signature.. According to Miguel Almiron’s agent, Newcastle beat FOUR Premier League sides to secure the signature of the Paraguayan playmaker. It was claimed a few days ago that Almiron ignored interest from Napoli and Inter Milan, with him intent on playing in the Premier League, however it seems he chose us over several of our top flight rivals. Miguel Almiron's agent claims #nufc beat four other Premier League teams to his signature. West Ham, Spurs and Arsenal have been credited with interest in Almiron in the past, but it’s yet to be revealed just which clubs were in the running. One thing this proves to me, regardless of which clubs were in the mix, is how much of a pull Rafa Benitez is when it comes to players joining the club. Notice Almiron mentioned Rafa as soon as he was asked why he joined. 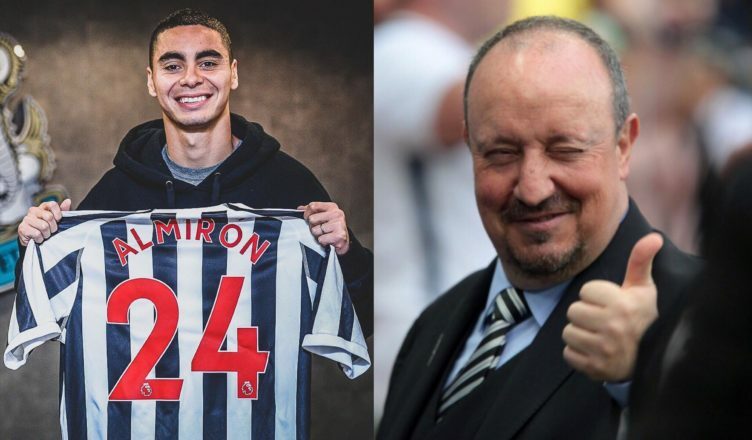 Yes we’ve often fallen at the final hurdle when it has come to Rafa’s top targets – largely due to Ashley’s lack of spending – however this news on Almiron suggests that we can STILL punch above our weight in the market for as long as Benitez remains at the club. Antonio Barreca scout report – A must read for all NUFC fans..
Alan Shearer says this is the real reason NUFC signed Miguel Almiron – Could he be right? “His agent claims”……well that agent was wanting £4million cut on top of the fee….believe what you will.